As managers and recruiters, we just thought that we had Millennials figured out, and then Gen Z arrived, and we are going to have to change the way that we do business again! 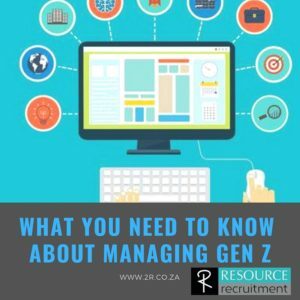 Generation Z (also known as Post Millennials or iGen) are those people roughly born between 1995-2010, in other words, the 18-23 year olds that we are recruiting and employing. Like each generation before it, they have their strengths and weaknesses, and whether we like it or not, we “created” them and we are going to have to adapt to what they bring to the work place. If you are wanting the management and motivation of these new recruits entering the work place to go smoothly, then it’s important to educate yourself on what to expect. This is probably one of the biggest criticisms that we get from employers of junior candidates, “They just totally lack initiative and work ethic”. Your typical Gen Z appears to get bored and lose interest with a complicated project, ands the more you try and challenge them to grow, the less they seem to embrace these projects. Millennials on the other hand, loved being given a project from start to finish, and having that sense of accomplishment and autonomy. Gen Z processes information faster than other generation thanks to Google, YouTube, Social Media and a host of other apps, so they have never needed to stick to a task as long a someone who did a school project using a stack of books. You want the answer, ask them! But you want a process seem through various steps and stages, and they are going to lose interest. It’s a skill that can be learnt, but perhaps smaller projects with faster results is a place to start, and harnessing their ability to process information rapidly can be used to our advantage. Although Gen Z can appear less focused than Millennials, while still at school they could create a document on their school computer, do research on their phone or tablet, while taking notes on a notepad, then finish it in front of the TV with a laptop, while face-timing a friend. You get the picture. In days gone by, you wanted to know something, you went and studied it through a training institution. There was a lot of “academic snobbery” and you were shunned if you did not have a matric, and through a good school at that. Over recent years, we have seen more and more job applicants doing their matric through home schools or correspondence, and studying via distance learning if at all. Gen Z’s are coming of age in a time when you can get just about any information on google, watch a YouTube video or study on line. This means that companies may need to change their policies on education requirements for certain positions, or they run the risk on missing out on the applicants that have the ability to learn and use their initiative that they need. Everything about Gen Z speaks of their desire for independence and traces back to them coming of age during the 2008 recession. They are not reliant on technology, they are technology. This highly technical and socially networked group have a strong entrepreneurial spirit, and majority of teens today, dream of one day owning their own business. Gen Z’ers were born social. Nearly all of Gen Z has a digital footprint. This means they seeks uniqueness in all walks of life primarily through the brands they do business with, future employers, etc. As a manager this means that they are not looking to be one of the team, and forgotten. They want to be treated like an individual and get the attention they deserve. The biggest thing you can you to attract a Gen Z to your company? Apparently, its flexible working hours. Why would you want to work 8am-5pm, when you can pull out your digital device at 2am and get the work done, and sleep until 10am? Although South African companies are keen to become part of a Global Market, they are not so keen to become part of a Global Employment Market, and are still reluctant to approach recruitment via Skype and Video interviews. As more of Gen Z enter the workplace, this is something that may need to be embraced. Gen Z have never known a time before cell phones, digital devices and the internet. They watch less TV and spend more time connecting on social media platforms, playing games and watching video content. While this has a massive impact on marketing strategies and where you should advertise, it also has a huge impact on the workplace. While you want to harness these technical knowledge, huge amounts of productivity can be lost. Another sad reality of this digital generation, is a loss of team work and team moral. In recent years, we have heard the increased complaints by employers, sometimes resulting in dismissal, of employees putting on headphones and settling down to work. Headphones, while cutting out distracting noise, also prevents you from networking and collaborating with the person sitting next to you, which would ultimately lead to positive relationships being formed. The Gen Z conversation is one that is going to continue as more of this generation enter the work place, and as technology continues to advances at such a rapid rate, it is said that his “15 year generations” are going to get shorter and split within themselves. But knowing where each generation comes from, and what they seek, can assist us as manager to better motivate and manage them, and put policies in place to help guide them. If you would like to learn more about Gen Z, have a watch at this hilarious Ted Talk by Jason Dorsey.